What Are Adenoids and How Can They Cause Problems? When a child’s tonsils become swollen and infected, symptoms such as a stuffy nose, pain when swallowing, pain in the ears, swollen lymph nodes in the neck, fever, and fatigue can develop. However, while the tonsils are getting all of the attention, many parents don’t realize that there are glands sitting at the back of the nasal cavity which are also playing a role. These glands are called the adenoids, and while they are responsible for helping fight off infection, they themselves can become infected. How do the Adenoids Become Infected? The adenoids play an important role in infection prevention and control in young children. After the age of 5, they begin to shrink, and their role becomes less and less important with age. For this reason, problems with the adenoids are primarily observed in infants and toddlers. As the glands work to trap germs and prevent infection from causing illness, they may swell. Often, this swelling subsides. However, there are other instances where the swelling remains and infection takes hold, a condition known as adenoiditis. When adenoiditis occurs, there are often correlating symptoms, many of which may be similar to tonsillitis. These may include sore throat, runny nose with discolored mucus, swollen lymph nodes in the neck, breathing through the mouth rather than the nose, and snoring. If a bacterial infection such as streptococcus is responsible, a doctor may prescribe antibiotics to help it clear. However, there may be instances in which adenoid removal, adenoidectomy, makes more sense. This may be the case if antibiotics are ineffective, if there have been recurrent infections, or if the adenoids have begun to interfere with a patient’s ability to breathe and swallow with ease. A pediatric adenoidectomy is a common, effective, and safe procedure which is typically performed in an outpatient setting. 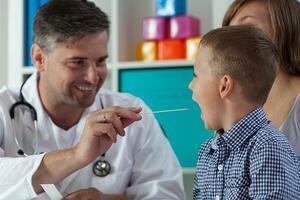 In many cases, the adenoids and tonsils will be removed at the same time. For the surgery, the patient will be placed under general anesthesia. Following the procedure, they will spend time in recovery as the anesthesia wears off. For a period of time following an adenoidectomy, the surgeon will give specific diet instructions such as eating only cool and soft foods and care instructions such as taking antibiotics. A follow-up appointment will be needed within the next 1 to 2 weeks. If your child is experiencing frequent episodes of tonsillitis or upper respiratory infection, contact an ENT for further evaluation. A condition such as adenoiditis may be contributing, and proper treatment could help reduce the severity and frequency of infection.